Turns out, there’s a fortune to be made in software. 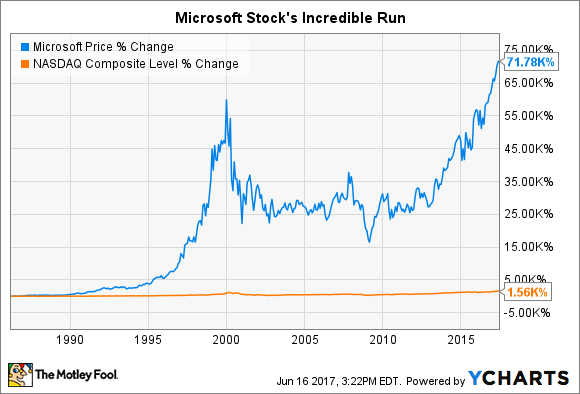 Arguably the world’s most dominant software company, Microsoft (NASDAQ:MSFT) has gone through several distinct phases over the course of its vaunted corporate history. Interestingly enough, the different phases of Microsoft, as an investment, closely track the tenures of its CEOs, though this relationship is more coincidental than causal. More recently, Microsoft has moved aggressively into new areas of computing, most notably cloud computing, under current CEO Satya Nadella. However, as you will see below, change comes slowly at a monolith the size of Microsoft. Let’s dive deeper into how Microsoft generates the bulk of its sales and profits, as well as how the company plans to evolve in the years to come. Productivity and business processes: Commercial and consumer editions of Microsoft Office (Word, PowerPoint, Excel, Outlook, etc.) and its various Dynamics products. Intelligent cloud: Public, private, and hybrid server products and cloud services such as Azure, SQL server, Windows Server, and value-added services like Microsoft Consulting Services. More personal computing: Windows operating system, Surface tablets, Xbox video game console and its gaming business, Bing search engine, etc. Crucially, these three segments are by no means created equal. They each hold a unique place in Microsoft’s current financial picture and its future growth plans. Here’s a more detailed snapshot of how each segment contributed to Microsoft’s financial performance during its fiscal year 2016. Data Source: Microsoft 2016 10-K. All numbers in $U.S. millions. As you can see, the general theme in understanding Microsoft’s financial performance is that productivity and business processes account for the largest percentage of operating profits, while more personal computing drives the greatest share of sales. However, in order to truly understand where the company’s sales and profits come from, I think it’s most useful to look at the financial performance of specific products, and thankfully, Microsoft also provides some information on this topic in its 10-K filings. Here’s a quick breakdown of the specific products that contribute close to 10% or more of the software-giant’s annual revenue. Especially when used in conjunction with the prior chart, you can truly get a sense of which specific products shape Microsoft’s fortunes. Most importantly, we see that Office contributes the lion share of sales in productivity and business processes, which then implies that Office is both extremely high margin in nature and contributes, by far, the greatest amount of the company’s profitability. We also see this bottom line-impact lessen slightly as we move down the list of products by revenue contribution. Hopefully, this has provided a nice window into what makes Microsoft tick in the here and now. Let’s also briefly examine how this seems likely to change in the years to come. Microsoft’s strategy going forward will be manifold, but three main themes seem like the most important for investors to watch. The first is to defend its Office franchise -- at essentially any cost -- against insurgent productivity software products like Alphabet’s Google Docs and other cloud-based services. Here, history might be working in Microsoft’s favor as the standardization and near ubiquity of Office across the corporate world will make it a tall task to kill Microsoft’s key profit center. The second is to continue to gain market share in cloud computing, a market that largely remains in its early days. Estimates vary as to exactly how large Microsoft’s current cloud-market share stands, though the general consensus is that Google, Microsoft, and IBM are each moderate players that all trail Amazon’s AWS by an appreciable margin. Still, with public cloud spending alone expected to double from $70 billion in 2015 to $141 billion in 2019, Microsoft has a lot of runway for future growth if it can continue to execute in its cloud strategy. The final leg of Microsoft’s growth plans should be to continue to lead in devices. After foundering badly with its early computing hardware efforts, Microsoft’s more recent Surface releases show that the company has developed a cohesive strategy, not unlike Apple’s, to get its software products into users’ hands by creating a sleek hardware experience. (Yes, it feels strange actually complimenting Microsoft’s hardware.) Similarly, it needs to continue to maintain its leadership alongside Sony in console gaming, which should give the company a toehold in future growth markets, like augmented and virtual reality. As long as Microsoft can generally accomplish these three tasks, the company should be able to maintain its place atop the global tech landscape. As a large and mature company, Microsoft’s days as a growth stock are certainly behind it, but the company can continue to use its immense profits to engineer shareholder returns through a combination of moderate top-line growth, and buybacks and dividends.